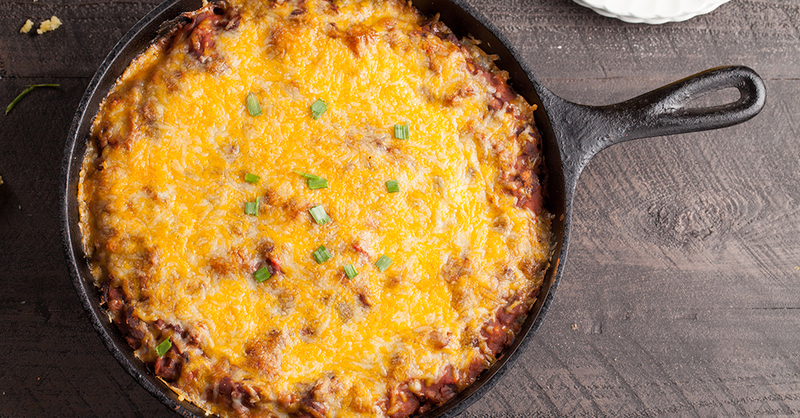 Who doesn’t love a bubbling skillet of spicy chili with gooey cheddar cheese? Make it even better with a salty secret ingredient – fritos corn chips! Buried under cheesy chili goodness, a layer of corn chips on the bottom of the skillet ramps up the dish with hearty crunch. We think it’s well worth it to simmer your own full-flavor chili, but if you’re low on time, just use your favorite store-bought brand. Either way, our entire family loves this meal, and we bet yours will too! In a large skillet, brown beef until cooked through, then drain excess fat, and add tomato sauce, diced tomatoes and chili seasoning. Stir to combine, then add kidney beans to skillet. Stir, cover, and simmer for 30 to 45 minutes or until chili thickens. Spread corn chips in bottom of a deep cast iron skillet. Ladle chili on top of chips, then sprinkle with half of chopped green onions. Top with shredded cheese, and bake in oven 10 to 15 minutes until cheese melts and chili bubbles. Garnish with rest of chopped green onion. Serve hot and enjoy!